Year 1 have worked very hard this half term learning about different types of clothing. We have carried out experiments to find out which sort of material would be the best for a rain coat for Billy Duck, we have thought about why people in different countries need to wear clothing made from different types of fabric and we have learned about the clothes people wore in the past. For homework the children have investigated the traditional clothing worn in a country of their choice. Their work is fantastic!! Thank you to parents and children for your brilliant work. In Year 1 we have been learning about stranger danger whilst using the Internet especially when using games and interactive technology. The children have been learning about the adventures of Kim and and Lee as the characters play online. The children learnt the key message of being SMART (Safe, Meeting, Accepting, Reliable, Tell) and thinking carefully about these areas when playing online. The children started the day with a fun assembly hearing about the key message of Stranger Danger whilst using online games. The children then went back to classes and discussed why it is not safe to share personal information online. Then the Year 1 children created masks and puppets to role play Kim and Lee's story. In the afternoon the children created a Safer Internet Day mascot just like SID Superhero to help the children to remember the SMART message when they are online. On Friday 10th February 8 year 4 children represented Chilcote at the Year 3 and 4 mixed football finals. The tournament took place at the Playfootball arena in Birmingham. The children had won the local partnership event to book their place at the finals. The tournament was made up of two groups. All of the teams in the group played each other once. This meant that Chilcote had four matches to try to qualify for the final. Chilcote started out with a match against Billesley school. Chilcote played really well in the match and after taking a deserved early lead they went on to win 5v2. In their second match, Chilcote played against Montgomery School who took the lead against the run of play. After Chilcote had equalised they began to get the goals their football deserved and they ended up winning the match 4v2. The third game proved to be a frustrating one as Chilcote dominated the match for long periods, but Clifton managed to score with their only two shots on goal. Chilcote managed to find the net twice but couldn't quite do enough to grab the winner they needed and deserved. The match finished 2v2. This meant that Chilcote needed to win their final game to definetly go through as group winners. They raced into a 3v0 lead in the match and were playing superbly well. Then, Meadows School made a couple of changes and the pattern of the game changed. They somehow managed to get themselves back to 3v3. Chilcote had run out of steam and just couldn't get another goal. This result meant that Chilcote finished in second place in the group on goal difference from Meadows School. So, they played a third and fourth place play off against Perry Beeches School. They played really well and gave everything in the match, but unfortunately didn't quite have the luck they needed and lost the match 6v4. This meant that Chilcote finished as the fourth best schoool in Birmingham - a remarkable achievement! Well done to all of the children who played in the tournament a fantastic result!!! Junior Choir have participated in 2 superb events over the past 2 weeks. We performed at the Genting arena at the NEC on Thursday 26th January as part of a choir of 6,500 children -the Young Voices choir. Everybody worked very hard with a 3 hour afternoon rehearsal followed by a 2 hour concert, returning to school at 10pm. 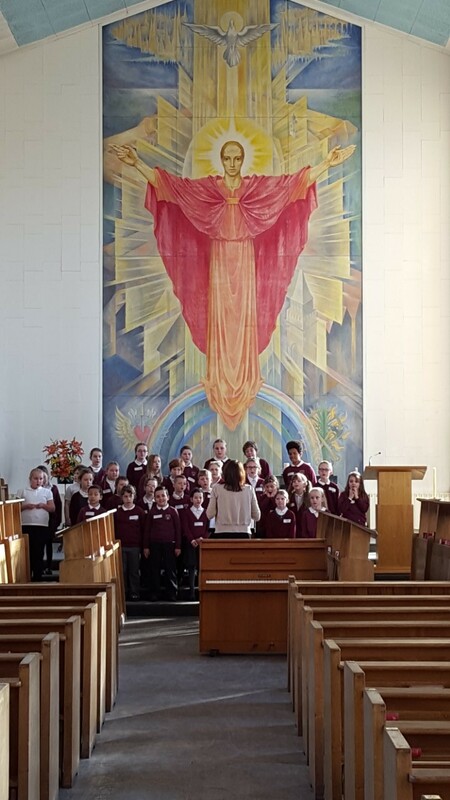 We were very proud of our choir who sang with enthusiasm and behaved beautifully throughout the very long day. Many thanks to our parent/carer helpers -Mrs Bundy and Mrs Harris and also to Mrs Drew and Mrs Peccol who all gave up their evening to support us. 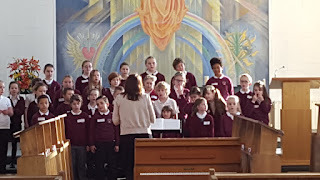 On Tuesday 7th February, we performed at Solihull school in a `Celebration of Choirs` concert. 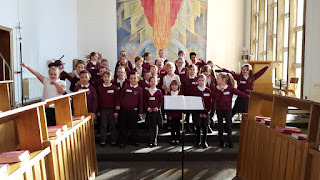 We sang by ourselves and then with other children from Gilbertstone school and Solihull school choirs. We sang very well considering that we had only had 1 rehearsal in which to learn our joint song! We had a lovely morning, singing, listening and watching an organ recital and then we stayed for lunch at the school refectory- what a treat! 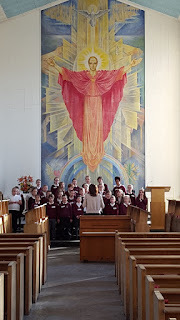 We received some lovely compliments about our singing and behaviour- well done Choir!You were a credit to Chilcote, being polite and friendly towards all the people we met at Solihull school. Thank you very much to the staff and parents who have supported us on this occasion- Mrs Peccol and Mrs Bundy- we really appreciated your support, help and enthusiasm. Thank you also to our families who have supported us in our performances- we hope that you have enjoyed the occasions. On Friday 3rd February Chilcote travelled to Great Barr to play against Perry Beeches in the yearly HMS Cup competition. This was a 9a-side competition. The game started with Perry Beeches on top and having most of the ball but as is the way with football Chilcote broke away and scored the first goal of the game with Damian slotting under the keepers legs. Chilcote then began to play some better football and scored again through Damian, with a worldy strike from just outside the box. Then just before half time Perry Beeches pulled a goal back from a corner. In the second half, Chilcote started the brighter and were dominating the ball. They had a few chances but nothing clear cut. Then, Perry Beeches were on the attack and got a penalty for a trip on their forward. The player dispatched the penalty very well and made it 2v2. Unfortunately, this buoyed the Perry Beeches team and they dominated the end of the match. Just before the end of the game there was heartbreak for Chilcote as Perry Beeches scored the winner and made it 3v2. Well done to all of the boys involved who represented the school excellently and did us proud!!! On Friday 3rd February, we took part in ‘Safer Internet Day’, although the national day is on Tuesday 6th February. We really enjoyed some activities such as making posters and having discussion sessions. Firstly, we had lessons which were different for each year group. Throughout the school we learnt about the dangers and about the positive uses of the internet. In Year 5, we talked about social media websites, apps and online games as part of our work. Also, in the afternoon we had an assembly about internet safety. We continued to talk about different online games and websites which are potentially dangerous. We talked about the potential dangers of these but also how we can make sure we use them for positive things. We already know so much about internet safety but with the help our teachers, we learnt a lot more. One of the most important things that we learnt was what to do if we find ourselves in danger online or if something just doesn’t feel right. 1. Speak to an adult at home about what you do online. 2. If you are in danger online, you should speak to an adult you trust or report it through the CEOP report button on the Pupil Page on the school website. 3. Check your privacy settings on social media. 4. Always ask before you share images of photos of other people. Today we learned how to keep safe when playing games on line. We used the story `Lee and Kim`s adventure- Animal Magic` and discussed the importance of not talking to strangers- in real life or on line. We met the character `Super Protector` and shared his advice on how to keep safe. The children learned about how to behave kindly and speak politely in different situations- both in real life and on line. We made animal masks (based on the story characters) and the children practised speaking politely and kindly to their friends. Today we have been learning about how we can be responsible users of technology. In particular, Year 6 have focused on risks, what is appropriate to share online and how to spot when we might be at risk of being manipulated. We watched a series of animations that followed three characters and discussed how they could have made better decisions when using the internet. We discussed how important it is to remain safe online by making sure that we only talk to people that we know in ‘real life’. We devised role-plays to explain and show the different ways that people can be manipulated and we also developed a list of top tips for staying safe online. 1) Keep private information to yourself – don’t share it. 2) Only share things with your friends and people you know in real life. 3) Don't trust anyone that you do not know. 4) Block things you don't like. 5) Think before you say or type. 6) Tell an adult you trust if you see something you do not like. 7) Be responsible and get permission to share photographs of others. 8) Recognise your body’s warning signs and act on them. We enjoyed our day and feel better equipped to stay safe online. To start Safer Internet Day, year 3 watched Hector's World. We discussed that there are people in our lives that we can trust with our personal information, and those that we can't. We focused on the character of Tama and how he used his emotions to decide whether something was safe or unsafe. In our classes we discussed things to look out for when staying safe online. We will continue to explore using the Internet safely during our Computing module, Digital Citizenship, this half-term. On Thursday 2nd February the Chilcote girls' netball team played their first match of the season in the 'high five netball league' against St Martins School. The match was played at home. In the first quarter, both teams started slowly and couldn't get their passing rhythm together. Both teams had a few chances but neither could capitalise on them. In the second quarter, St Martins began to dominate the ball and made their passes stick better. They took an early lead in this quarter to make it 1v0. Chilcote then had one of their few chances in the quarter and scored to make it 1v1. In the third quarter, the game continued in the same vein as before with St Martins having more of the ball. Eventually, their pressure told and they went 2v1 up. In the final quarter, Chilcote came out of the blocks flying and scored almost straight away to make it 2v2. Then, St Martins managed to score, which looked like being the winning point, but with just a minute left to play Chilcote's Goal Shooter held her nerve to level the match. It ended 3v3. Well done to all of the girls who played in the match, they represented the school brilliantly!! !